Researchers at McGill and the Jewish General Hospital have struck what may be the penultimate blow in the war against multiple sclerosis (MS.) A new experimental treatment completely reverses the devastating autoimmune disorder in mice and might work exactly the same way in humans. MS is an autoimmune disease in which the body’s own immune response attacks the central nervous system, almost as if the body had become allergic to itself, leading to progressive physical and cognitive disability. The new treatment, appropriately named GIFT15, puts MS into remission by suppressing the immune response. This means it might also be effective against other autoimmune disorders like Crohn’s disease, lupus and arthritis, the researchers said, and could theoretically also control immune responses in organ transplant patients. Moreover, unlike earlier immune-supppressing therapies which rely on chemical pharamaceuticals, this approach is a personalized form of cellular therapy which utilizes the body’s own cells to suppress immunity in a much more targeted way. 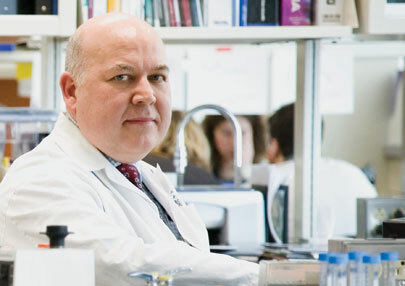 GIFT15 was discovered by a team led by Dr. Jacques Galipeau of the JGH Lady Davis Institute for Medical Research and McGill’s Faculty of Medicine. The results were published August 9 in the prestigious journal Nature Medicine. This effect, explained Galipeau, converts B-cells — a common form of white blood cell normally involved in immune response — into powerful immune-suppressive cells. Unlike their better-known cousins, T-cells, naturally-occurring immune-suppressing B-cells are almost unknown in nature and the notion of using them to control immunity is very new. “GIFT15 can take your normal, run-of-the-mill B-cells and convert them — in a Superman or Jekyll -Hyde sort of way — into these super-powerful B-regulatory cells,” Galipeau explained. “We can do that in a petri dish. We took normal B-cells from mice, and sprinkled GIFT15 on them, which led to this Jekyll and Hyde effect. MS must be caught in its earliest stages, Galipeau cautioned, and clinical studies are needed to test the treatment’s efficacy and safety in humans. No significant side-effects showed up in the mice, he said, and the treatment was fully effective with a single dose.